Some days ago, I awoke with thoughts of the song, “No Man is an Island.” It’s not the type of song that one hears on the airwaves. Our subconscious mind has a way of linking new information with lessons learned in our youth. Each man’s grief is my own. Each man as my friend. During my senior high school years, I learned this song as a Glee Club member. Through an Internet search, I discovered that this song is still sung by high school and church choirs. 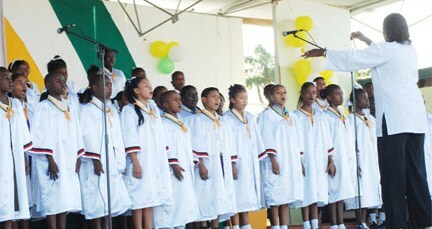 I liked the traditional rendition by the EskDale High School choir in spring 2012. There is even a Reggae version by John Holt. In their Global Employment Trends 2013, released in January 2013, the International Labor Organization (ILO) reported that the number of unemployed people worldwide in 2012 rose by 4.2 million, bringing the unemployed to 197 million. Young people worldwide have been especially hit hard. In advanced economies some 35 percent of unemployed youth have been out of work for six months or longer. Discouraged, more and more of them are leaving the labor force. The ILO Director-General noted that “the global nature of the crisis means countries cannot resolve its impact individually.” We are all in this together. No country stands alone. We need one another. On 17 September 2013, the U.S. Census Bureau released America’s official poverty rate for 2012. Fifteen percent or 46.5 million Americans live at or below the poverty line. But these figures did not deter the U.S. House of Representatives from passing a bill, two days later, to cut government food-aid programs by $39 billion over the next ten years. Next year will be bleak for 3.8 million Americans who will be scratched from the list of food-stamp beneficiaries. The One Percent—who have used their wealth to hijack our government—have no sense of social responsibility towards citizens who face hunger or food insecurity, underemployment or unemployment, homelessness or displacement. The One Percent, their vassals, and henchmen have forgotten the lessons of history. In time, the grief of the oppressed becomes the grief of the oppressor. Each man’s grief is our own. What is a star without his or her fans? What is a business without its customers? What is a factory without its workers? What is an army without our sons, daughters, brothers, sisters, fathers, and mothers? We need one another. We are interdependent. For how long can we enjoy the fruits of the labor of those we despise? For how long can we buy unnecessary stuff produced by workers who lack the basic necessities of life? For how long can we kill innocent men, women, and children in the name of religion, democracy, justice, or whatever justification we devise? No man is an island. No man stands alone. We need to defend one another. “In time, the grief of the oppressed becomes the grief of the oppressor.” You have struck home. How astonishing it is that so many of those who advocate things like cuts in food stamps think that their lives can remain insulated from the human tragedy that they abet by such actions. I, too, find this astonishing, Dr. Stein. It’s been bothering me for a long time. I read this morning that the head of the Roman Catholic Church is finally addressing joblessness and a world economy that makes people disposable. I’ve learned long ago that anything without a context is a pretext. Dr. Hewick, thanks for reading my post and for your response to Dr. Stein’s comment. Thanks for dropping by, Rachel, and thanks for sharing my blog post on Facebook. Cyril, thanks for all your support. The Republicans were quite willing to support Obama to bomb Syria, but when it comes to the plight of the poor, they are heartless and inconsiderate. Darius, it’s distressing to observe that the giant corporations that profit from war and its aftermath have a greater voice than organizations that represent and fight for the poor. My fear is that the more countries become desperate for resources, the more desperate, reckless, and ruthless their actions to gain them – instigating conflicts and creating diversions to circumvent their true agendas. When resources are plentiful populations increase. It’s when resources become scare that populations decline to more manageable sizes, either by starvation, disease, or a source of food for those most strong. We see this play out in the wild animal populations. It’s nature’s way of keeping things in balance. We humans are just higher up on the food chain and, unlike animals we don’t contribute to the environment. We take and we destroy because we have the capacity to control and impact their existence, unlike them. Thus, their free will is far lesser than ours. What we see playing out is an overpopulated human world taking and taking and taking, and destroying and destroying and destroying. As a result we are turning on each other because we are now in direct competition with ourselves/humans for resources. And that is not a good place to be. Thanks for sharing your thoughts on this issue, Gigi. I agree with you. The human species are definitely not in a good position as we fight each other for dwindling resources. Our need to come together to find solutions for our global crisis becomes even more critical. Words are actions too and the more we spread such words, the more likely actions will follow. Totally agree with you, Angela. That’s why the One Percent control the dissemination of information. They know well the power of words. monitored/control/regulated is where the battle begins. available…..social media is unstoppable like a runaway train. The Chinese political elite greatest worry today…..
we risk armagdeon….hope this never happens…. Forever the optimist…..better to live in hope than die in despair…..
in the afterlife if it exists. Kamptan, there’s a lot of false or misleading information available online. The challenge today is in discerning who’s telling the truth. after the bishop of GT who rebuilt Brickdam Cathedral after it was destroyed by fire. Almost to living in a state denial…..
Compton Theodore Gaulton De Castro…..
Thomas believed most of what he read….I disbelieved most of what I read. influenced by my early childhood,adulthood,ageing process. I always thought Guyana produced the best RUM on the planet. I no longer believe it to be so….!! Proof of the pudding is in the tasting. Proof of the truth is in the believing. As we age we become more sceptical even cynical of what we consume…. And as you rightly suggested discerning the truth can be daunting. our maturing process as we age gracefully into senile dementure…. Not wishing to continue this epitath ….I will drift into “meditation” mode. Hi Rosalie. I look forward to reading through your archives. This post and it’s dialogue gives me a hope, though that might seem a paradox to you. I think it’s about not feeling alone – knowing others are discerning issues, and working for change too. Thanks for that. Thanks for reading and sharing your thoughts, Bruce. I know that I’m not alone in my concerns for our plight as a nation and for our planet. But are our voices enough to bring about change? Will change come too late? I live in hope. It is a real possibility.Whenever I feel gnawing doubts, I try to recall what Thomas Merton wrote years ago in his letter to a young activist. To paraphrase – you can’t depend on results – only the rightness of your work. Thanks, Bruce. I will hold on to that bit of wisdom from Thomas Merton. Please let me add my two cents here…. that will change the world …truth to power. So true, Kamptan. I’m doing the little things and hope that they do matter, however small.